When I first tried the brand new line, Nature's Rescue, by Redken I was freaking out in excitement. This is seriously their best line yet (and that says a lot because they have some incredible products!) Paraben-free, sulfate-free and silicone-free, this line is ridiculously amazing and not just because it smells like a day at the beach (it's strange that the beach scent is one of my all-time favorites as far as scents, yet, you won't catch me on a beach ever. Hmmm, psychoanalyze that one). The line contains Nature's Rescue Refreshing Detox Shampoo (no color to this one and it cleans fabulously), Nature's Rescue Cooling Deep Conditioner (literally cools the scalp while it conditions), Nature's Rescue Radiant Sea Spray (perfect beachy waves - a step-up from Bumble and Bumble's which is the best compliment I can give) and my ultimate fave of the group - Nature's Rescue Refining Sea Polish. This hair polish (think body scrub but for the hair) actually contains little tiny grains of pumice to remove impurities to make the hair feel smooth and look shiny. I have no clue if I'm actually removing impurities when I scrub my head with it - but, my hair looks incredible and smells amazing. I was actually shocked that the grains didn't stick to anything (you know how body scrubs sometimes do) and completely washed out of my hair (almost dissolved when the water hit them). Incredible line and a definite must check-out. Note: A sample of this line was sent to me by a PR representative working with Redken. So when I first saw the new Aerate 08 Bodifying Cream-Mousse from Redken, I was like, what is this tomfoolery? (Okay, maybe I didn't actually use the word tomfoolery, but it makes me laugh to picture myself saying it, so let's just go with it). I haven't used mousse in a looong time, but this stuff looks nothing like the good old crunchy hair inducing product from the 80's. For one thing, it comes in a jar. For another, it's a completely different texture - sort of a thick, whipped foam. It smells light and fresh, a little bit like soap, which I like because I feel like it masks other scents that you might encounter in your day that would otherwise sink into your hair. It's also color-safe, which gets big points from me for not stripping my hair of its (expensive) color that seems to fade way quicker than I want anyway. It's supposed to give your hair body and volume and I have to say, I'm kind of digging it. I've been rubbing a small amount between my hands in the morning and working it into my damp hair, then blowdrying it a little before letting it air dry the rest of the way. I'm definitely seeing a little more "oomph" to my 'do, especially if I do a little scrunching of the waves as they dry. But my most favorite part of it is that it leaves absolutely no crunch or stickiness in my hair. That's my absolute pet peeve and will make me immediately stop using any hair product, so I was really happy not to find it here. Definitely two thumbs up for this one. Aerate 08 Bodifying Cream-Mousse retails for $16. 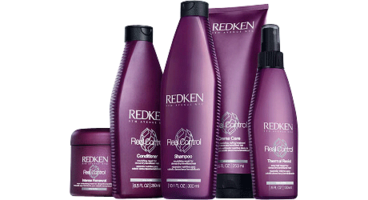 You can find a salon near you that carries it on Redken.com. Note: A sample of this product was sent to me by a PR representative working with Redken. I have pretty straight hair, but even when I blow dry it, it doesn't get completely straight most of the time. And when I do, it's usually a little frizzy. But with the fantastic combo of Redken's Align 12 Protective Straightening Lotion and my trusty straightener, I can get pin-straight locks without all that much effort. (I'm all about making the lowest effort possible to get results). I just use a few pumps of the Straightening Lotion, which is lightweight, and it really helps get rid of the weird, twisty kinks that sometimes my hair gets. (Of course I can't get big, loose curls. Of course...) The lotion leaves my hair soft, but it seems to make it a lot less frizzy and it definitely helps make it as straight as possible. I've never really tried any products to make my hair straighter (I'm usually trying to do the opposite) so it's kind of a revelation for me. Especially because Redken has other straightening products, like Sheer Straight 06, a straightening gel that I'm really going to need to try next. Who knew I could ever be excited about my boring, straight hair? The Color Extend Sun collection is available now. Check out Redken.com to find a salon where it's available near you. You can find the Color Extend products at Redken salons and at Redken.com. Get yourself an Overnight Treat at your nearest salon, call 1-800-REDKEN8 or visit Redken.com. Last month, I was lucky enough to be invited to the launch of Redken's newest line - Real Control. Designed for women with sensitized hair (hair that is chemically or mechanically damaged), this line is meant to "keep unruly hair under control." It soothes and conditions dense, dry hair and leaves it shiny and gorgeous. According to Kaz Amor, well known colorist and Redken Hair Care Consultant , "Many of my clients come into the salon looking to smooth, repair, and moisturize their hair. Real Control's multi-taking formulas take the stress out of their routine while providing the lush results these women are looking for." One of the great things about the Real Control line is that you can really customize your treatment depending on which of the products you use.